• Make it easy and get everything you need with a complete sushi kit! 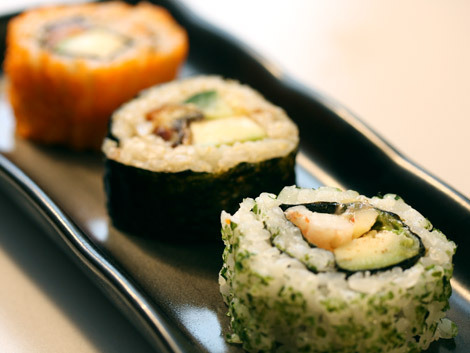 * Try making your own varieties of sushi with any ingredients you like. Before we start making our makizushi, we need to prepare our sushi rice. To make sushi rice, sticky short grain rice is mixed with a special sushi rice vinegar. 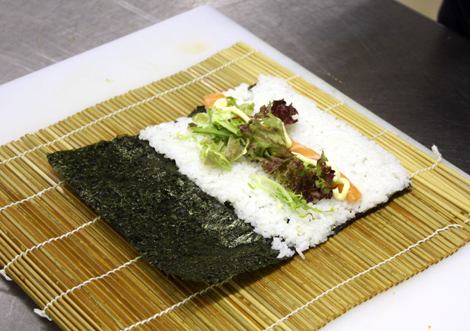 You can find more about how to make perfect sticky rice and sushi rice on our recipe blog. 1. Once you have your sushi rice prepared, you will need to begin by laying out a preparation area with your makisu rolling mat. 2. 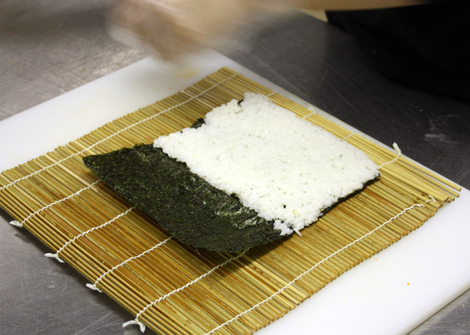 Cover two thirds of one side of your nori seaweed with your sushi rice approximately 1cm high. 3. Add your ingredients on top of the rice. You can choose any combination of ingredients that compliment each other well. We went for salmon, salad and mayonnaise for this one. 4. Now for the fun bit. 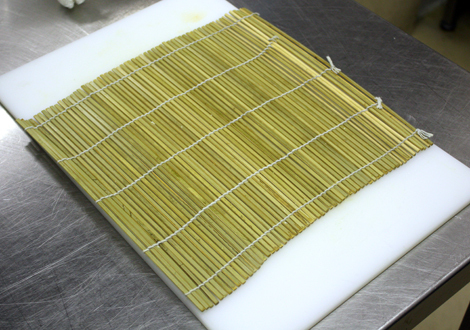 Using the wooden rolling mat, start rolling up the ingredients while keeping the roll tight. 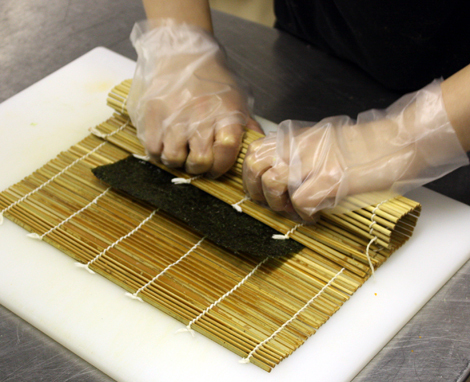 Once you have finished rolling, the moisture from the rice will be absorbed by the nori which will help it stick together to form a completed roll. 5. You can then cut your roll into 6-8 pieces and serve with some soy sauce and wasabi. • Try wrapping your sushi rolling mat with cling film before you start rolling at this will not only make the mat easier to clean after using, but helps the sticky rice from getting stuck on the mat. • It is a good idea to have a bowl of water next to you when you are making makizushi as it is important to keep your fingers wet so that the rice doesn’t stick to them. It is also a good idea to keep the knife wet when you cut it to guarantee that you get a clean cut. • If you want to be really clever, you can make what’s called an Uramaki roll, or an inside out roll. This is made with the nori on the inside and the rice on the outside of the roll. • Makizushi usually come in two types, futomaki and hosomaki. 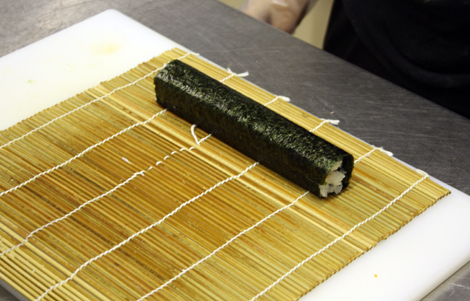 Futomaki is a thick roll like the one we are making in the photos above with a selection of ingredients inside. Hosomaki is a thinner version, usually containing just one ingredient such as tuna, salmon or cucumber. • You really can use any types of ingredients for sushi rolls. Many of the popular ones like California Roll (Crab Sticks, Avocado & Cucumber) and the Philadelphia Roll (Smoked Salmon, Cream Cheese & Cucumber) were both invented outside of Japan. Thanks for this. I started trying to make my own suhimaki this year. A bit of trial and error at first, but love it now. Don’t know about marmite in a sushi roll though….uuugggh! Sushi is a Way of cooking, not a set of dishes…so be creative indeed!!! Natto and marmite? That could either be the most genius invention ever, or something else very… interesting indeed!